In 2013, New Jersey became the third state in the U.S. to legalize Internet gaming but the first to require any form of analytic evaluation. The law, which permitted adults 21 and over to gamble online with the State’s boundaries, provides that online operators must partner with Atlantic City casinos to offer online games, regulated by the state’s Division of Gaming Enforcement (DGE). In addition, the law mandated that the DGE contract with an outside entity to provide yearly reports, examining the overall impact of Internet gaming and patterns of play on problem gambling. The Center for Gambling Studies (CGS) at Rutgers University was tasked with creating an analytic framework that could accommodate a variety of gaming platforms and standardize data for evaluation in yearly reports. The CGS also undertook a select series of studies, including two state-wide prevalence studies, to identify the relationship of those who gamble online to the prevalence of problem gambling. This partnership was the first such collaboration between a regulator and research center in the field of gambling studies in the U.S. The primary purpose of the collaboration was to establish a framework for understanding the nature, course and behavior of online gamblers through a multi-factorial approach: verifiable play data along with self-reported gambling behaviors. An unanticipated benefit of this system has been the inclusion of operators as stakeholders in the process. The primary focus of this effort is evidence-informed accountability. The leadership at the DGE is invested not only in regulating income-generating recreation but also in consumer protection. As a result, the regulators required that all operators offer specific responsible gambling features: 72 hour cool-off, self-exclusion, and deposit, time, and loss limit-setting. They are also required operators to submit their data for analyses in a format prescribed by the CGS and to fund the outcome evaluation analytics and related studies. Unlike many research projects, where the researchers are tasked with obtaining the data, operators in New Jersey submit their data annually in a standardized format to the DGE who, in turn, works with the CGS to ensure the integrity of the data for analysis. The synergy between regulators and researchers has generated a number of positive outcomes. First, working together with regulators and operators ensures operator compliance and encourages communication to understand and resolve differences across platforms. This, in turn, facilitates the development of consistent data fields for evaluation. Second, establishing a standardized empirical framework provides a guide for harm-reduction efforts. For example, analyzing play patterns before, after, or both before and after use of specific limit-setting strategies provides an objective look at the relationship of the use of those strategies to betting patterns and expenditures over time. Those evaluations should ultimately lead to designing and testing alternative strategies for improving adoption, such as consistent branding and continued use of the most effective strategies to limit losses over time. When New Jersey undertook to develop a uniform system, there were no models to follow. The regulations were in development, informed by few examples, primarily from abroad and from the scant research available into play patterns from small studies and play data that was limited in scope. The first barrier to uniformity we encountered were variations in format. Initially, the requested data was provided by each operator in a different format, underscoring the vast differences in accounting for specific aspects of play, such as cashable and non-cashable bonuses, wagers, deposits and deposit type, losses, wins, play across sites and the use and discontinuance of responsible gambling features. Therefore, it was necessary for the researchers to codify all variations regarding the first year’s data fields to produce a unified set of variables and a standardized platform for delivery going forward. An additional challenge was the lack of a consistent mechanism for tracking players across multiple platforms, called “skins.” In most systems, players were tracked by social security number, birth date, gender, and address, however, not all providers kept all such information. In addition, for the safety of individual player data, the researchers requested data that was deidentified except for gender, age and zip code, which were necessary for analyses. 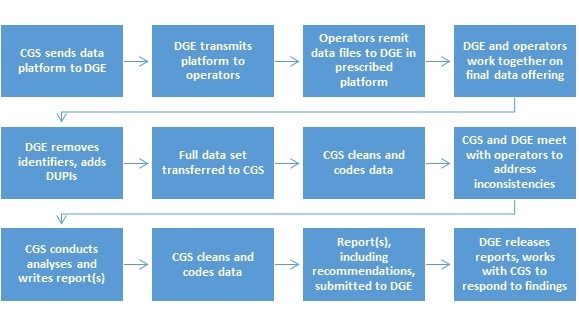 In response, the DGE created a “DUPI,” a unique player identifier, which replaces personal data and facilitates tracking each individual player across all platforms each year. A third barrier to analytics was establishing uniformity in a single data set. Even with the prescribed platform, there is still wide variation among providers, who often utilize multiple files to house different variables in the platform (e.g. demographics, poker, tournament, casino). 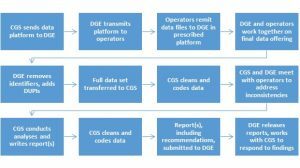 The CGS data analyst is required to clean, recode and merge files from each provider then merge all files into a single data set for analyses. Working with the DGE and providers to interpret and standardize each provider’s submission was a time-consuming challenge in this process. Additional challenges were presented by the sheer size of the data and the method of acquiring and storing roughly 10 TB of data per year. Most operators are headquartered outside of the U.S. and needed to transfer their data securely. Multiple options were considered, including building an encrypted data tunnel from each provider to the University, however most raised concerns about the security of the data before identifiers were removed. Ultimately, we determined the safest method was for each operator to transfer their data individually to DGE who would then transfer the data, with DUPI substituted for identifiers, to a hard drive which was physically transported by a CGE staffer. Ongoing issues with data size, however, remain problematic. Due to the volume of the data, individual runs take hours for the data analyst to complete, adversely affecting productivity. In addition, converting the server to a scratch space for analyses and using individual storage units is costly and only a short-term solution. The CGS is currently evaluating whether using a big data environment with self-encrypting storage and scratch space would meet the needs of data security and improve processing time. Initially, devising solutions to these sizeable issues delayed analytics by about a year. We currently use the workflow outlined in Figure 1. A key feature of this collaborative system is that it is dynamic, responding to confounds, new gambling offerings, and challenges that may arise. In addition, findings from analytics have identified important information with implications for future responsible gaming efforts. Notably, a growing proportion of online gamblers bet during normal working hours. Whether or not these players are gambling while at work on company equipment or smart phones was preliminarily confirmed in the first New Jersey prevalence study (Nower, Volberg, & Caler, 2017) and will be further explored in future studies. A second important yet troubling finding from the player data is that only a small proportion of individuals opt to use responsible gambling features and, of those, players who initiate then remove the features are most likely to increase their spending and their losses (Nower, Caler & Guan, 2016; Nower Caler & Peters, 2017). These findings suggest it is important to raise awareness of limit-setting options through branding, incorporation at sign-up, education on each feature, and reminders for those who discontinue using a feature and increase the intensity of frequency of subsequent bets. The DGE has created a uniform branding logo that operators are required to display on each page and link to RG sign-ups. Improving RG accessibility and utilization are primary goals for the upcoming year. The New Jersey regulator-researcher-operator partnership is a relatively new approach to gaming regulation in the United States. The platform, which continues to evolve, could be a useful model for other jurisdictions to follow. It is also possible that other jurisdictions could partner with New Jersey to manage and evaluate their data without undertaking the creation of a similar system. As gambling opportunities continue to expand, such a collaboration is one way to develop evidence-based regulation and to inform legislation with built-in harm-reduction safeguards for problem gambling. Broda, A., LaPlante, D. A., Nelson, S. E., LaBrie, R. A., Bosworth, L. B., & Shaffer, H. J. (2008). Virtual harm reduction efforts for Internet gambling: effects of deposit limits on actual Internet sports gambling behaviour. Harm Reduction Journal, 5, 27. Nower, L., Caler, K. & Guan, R. (2016). The Prevalence of Online and Land‐Based Gambling in New Jersey: Calendar year 2015 Report to the Division of Gaming Enforcement. New Brunswick, NJ: Authors. Nower, L., Caler, K. & Peters, E. (2017). The Prevalence of Online and Land‐Based Gambling in New Jersey: Calendar year 2016 Report to the Division of Gaming Enforcement. New Brunswick, NJ: Authors. Nower, L., Volberg, R.A. & Caler, K.R. (2017). The Prevalence of Online and Land‐Based Gambling in New Jersey. Report to the New Jersey Division of Gaming Enforcement. New Brunswick, NJ: Authors. Sproston, K., Hing, N., & Palankay, C. (2012). Prevalence of gambling and problem gambling in New South Wales. Sydney: NSW Office of Liquor, Gaming and Racing. Wardle, H., Moody, A., Griffiths, M., Orford, J., & Volberg, R. (2011). Defining the online gambler and patterns of behaviour integration: Evidence from the British Gambling Prevalence Survey 2010. International Gambling Studies, 11, 339‐356. Wood, R. T., Williams, R. J., & Lawton, P. K. (2007). Why do internet gamblers prefer online versus land‐based venues? Some preliminary findings and implications. Journal of Gambling Issues, 20, 235‐252. Lia Nower, J.D., Ph.D., ist Professorin and Direktorin des Center of Gambling Studies an der Rutgers University, New Brunswick/ New Jersey. Dieser Eintrag wurde veröffentlicht in Ausland von admin. Permanenter Link des Eintrags.